(Nanowerk News) The popular dietary supplement vitamin E, loaded into special medicated contact lenses, can keep glaucoma medicine near the eye — where it can treat that common disease— almost 100 times longer than possible with current commercial lenses, scientists reported here today. In a presentation at the 239th National Meeting of the American Chemical Society (ACS), they described use of vitamin E to develop contact lenses that may deliver more medication for glaucoma and perhaps other diseases to the eye. Contact lenses containing vitamin E like the one above can treat glaucoma, the second leading cause of blindness, and other eye conditions, scientists are reporting. Anuj Chauhan, Ph.D., who headed the research team, explained that glaucoma is second only to cataracts as the leading cause of vision loss and blindness in the world. It affects almost 67 million people. Eye drops that relieve the abnormal build-up of pressure inside the eye that occurs in glaucoma, are a mainstay treatment. "The problem is within about two to five minutes of putting drops in the eye, tears carry the drug away and it doesn't reach the targeted tissue," said Chauhan, who is with the University of Florida in Gainesville. "Much of the medicine gets absorbed into the bloodstream, which carries it throughout the body where it could cause side effects. Only about one to five percent of drugs in eye drops actually reach the cornea of the eye." Chauhan and colleagues have developed a new extended-release delivery approach incorporating vitamin E into contact lenses. The invisible clusters, or aggregates, of vitamin E molecules form what Chauhan describes as "transport barriers." that slow down the elusion of the glaucoma medication from the lens into the eye. The drug released from the lens into the eye stays in the tears far longer than the 2-5 minutes with eye drops, leading to more effective therapy. "These vitamin structures are like 'nano-bricks'," Chauhan said. "The drug molecules can't go through the vitamin E. They must go around it. Because the nanobricks are so much bigger than the drug molecules – we believe about a few hundred times bigger – the molecules get diverted and must travel a longer path. This increases the duration of the drug release from the lenses." In research with laboratory animals, the lenses containing vitamin E nanobricks administered drugs up to 100 times longer than most commercial lenses. The lenses could be designed for continuous wear for up to a month, Chauhan said. In addition to treating glaucoma, the contacts could help other eye conditions, such as cataract and dry eye. Cataract is a clouding of the lens of the eye, and dry eye involves decreased production of tears. It affects about 2 in 10 people and can lead to more severe eye problems. "Vitamin E is a proven nutraceutical that in small amounts is good for the eye because of its ant-oxidant properties. Also Vitamin E presence in the contact lenses blocks UV radiation, leading to increased protection against the UV light. Our research has shown that the vitamin can be loaded into the lenses without any reduction in transparency. We believe it could be helpful in disease treatment and in prevention as well," he said. 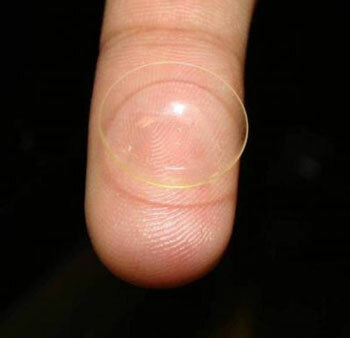 Chauhan said that clinical trials of the new lenses could begin within a year to 2 years. We have developed a novel approach of extending the duration of drug release from contact lenses by including nanosized aggregates of Vitamin E in the lenses. The Vitamin E nano-aggregates force the drug molecules to travel in a tortuous path leading to increased drug release durations. Another benefit of Vitamin E incorporation is that Vitamin E is known to be an anti-oxidant, whose slow release from lenses could also help in prevention of ophthalmic diseases like cataract and glaucoma. Furthermore, Vitamin E blocks UV radiation, leading to reduced ocular damage from the UV light. Our research has shown that Vitamin E can be loaded into the lenses without any reduction in transparency. The drug release durations from Vitamin E loaded lenses are about 100 times longer than from commercial lenses for several ophthalmic drugs including glaucoma drug timolol, anti-inflammatory drug dexamethasone, and anti-viral drug flucanozole. Thus, Vitamin E loaded lenses could be highly effective in synergistic prevention and treatment of ophthalmic diseases through extended delivery of the desired drugs and the nutraceutical Vitamin E. Animal studies in beagle dogs are ongoing to explore glaucoma treatment through Vitamin E laden contact lenses.